Dr. David Hill is a Thelemite who associates with Scarlet Woman Lodge in the Valley of Austin, Texas. I first encountered mention of Aleister Crowley and Thelema in Israel Regardie’s book, The Golden Dawn. I had been practicing Golden Dawn ritual on my own while engaging in an early exploration of Western ceremonial magick. My first copy of The Book of the Law was given to me by a Wiccan priestess. She had the sense that Thelema would resonate with me, and she was correct. At that time, I had given up on organized expressions of religion and had created my own personal religious and mystical expression of my self and my Will. When I read The Book of the Law, I had a classical religious conversion experience. I felt that the book spoke directly to me. Thelema’s message of individual liberty and self-mastery is a vital message that inspires me daily. I find Crowley’s definition of magick to be quite elegant: “The Science and Art of causing Change to occur in conformity with Will.” There can be many approaches to magick under this definition. First, the individual must undergo the continual introspection required to understand himself and his Will. That alone is a tremendous task and one that continues throughout life. Crowley notes that there is a science and an art to magick. When attempting to cause a new form of change, it is useful to have scaffolding in the form of ritual, formal meditation, or some similar practice. However, once the technique of causing change in that particular manner has been integrated, I find that full formal ritual is not as necessary. The bottom line is causing change in consciousness and in life to orient your reality more closely with your Will. Causing change could be taking a longer path to work in order to burn a few more calories so that you can care appropriately for the vehicle of your body. Magick need not be anything as exotic as ritual, but I do find that ritual helps tremendously when attempting more radical changes. A few points stand out regarding Thelema: the focus on self-mastery, the concept of True Will, and the concept of the Holy Guardian Angel. It can certainly be argued that these concepts come to Thelema from earlier expressions of Western Esotericism. However, Thelema’s focus on these three points provides modern aspirants with an updated expression of these tools, which are advantageous for those of us seeking the Light. The Abrahamic religions espouse an external locus of control. Thelema posits that the individual is an expression of the divine and requires no external divine Father; rather, we are all individually accountable for our lives and our spiritual progression. Self-knowledge and self-mastery comes into play in understanding how to come to the most perfect expression of that divine Self through manifesting your True Will. The concept of the Holy Guardian Angel (or Augoeides/Daemon/Higher Genius) is extremely useful in understanding the individual’s perception of a link to the divine. 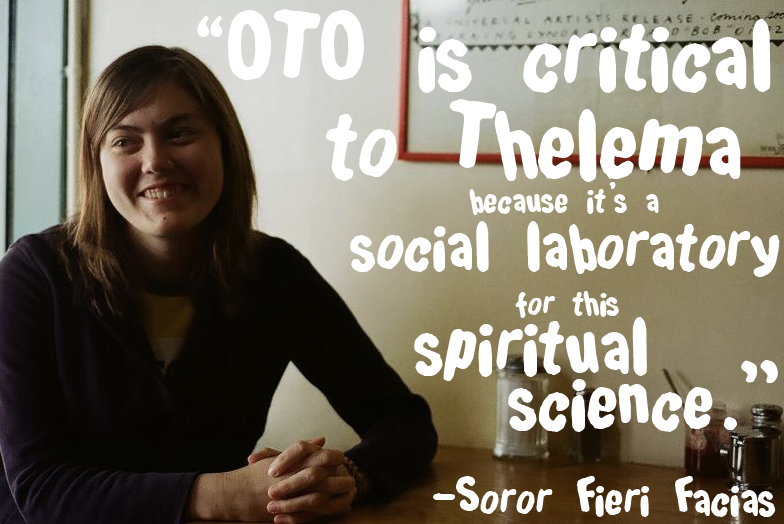 In my mind, OTO stands out among fraternal organizations for two reasons: OTO members actually practice magick rather than just reading about it and the structure of OTO includes a social experiment. The Order’s founding documents (namely Libers 52, 101, and 194) lay out a model for a Thelemic society. I have always found this societal experiment to be intriguing and inspiring. The more that I engage with this model for Thelemic society, the more rewarding I find it to be. I am currently engaged in the government of the Order and in presenting pastoral counseling workshops across the United States. I find both to be extremely rewarding uses of my time as I get to give back to the Order that has given me so much. I have been a member of OTO for over 15 years, and I fully expect to stay a member for life. The core of my practice involves Resh, Will, and meditation. I have been performing Resh and Will for years. These two practices are constant reminders that I am engaged in the Great Work. We only have a short time in our journeys around the sun. These constant reminders allow me to maintain my focus and productivity. Many other religions use these tools. I recall finding a likely spot near a window in an airport to say evening Resh. As I was engaged in my practice, I was joined by a Muslim and a Jew. We all engaged in our practices and went our separate ways without saying a word to each other. It was a great experience. Meditation is my other constant practice. I engage in mindfulness meditation and chakra meditation. These practices help to keep me focused and bring me closer to Union on a daily basis. I do engage in other practices as needed, namely ritual, talismanic work, and divination. One factor that I would address is the need for a body-based discipline. I do believe that it is important to engage in some form of physical practice. I practice kung fu and qi gong. I jog several times per week, and I occasionally practice hatha yoga and tai chi. I believe that it is important to keep the body healthy and focused as our minds and bodies are inextricably linked. Keeping a fit body enables you to keep a fit mind. I would imagine that the concept of Will versus want is the most difficult thing to grasp initially. OTO is an Outer Order. One of its functions is to assist in the development of a Thelemic society. EGC presents an extremely potent religious rite to the world, which brings many people to Thelema, and OTO has accomplished much in recent years through the popular media and publishing. My answer to this is similar to that given for the previous question about how Thelema is different from other philosophies. However, I feel that it is important to engage in as many practices as possible in order to discover for one’s self what your own points and practices of import are. I do. I hesitate to get too detailed about the results of my personal practice. However, I will note that I have had great luck with intentional suggestion during states of deep ritual trance. It is possible to implant instructions deeply enough that they are forgotten by the conscious mind, sometimes for several years. That is one method that I have used to successfully avoid the lust of result. I have been very impressed with the professional growth of O.T.O. in the United States since the founding of U.S. Grand Lodge. I expect that the Order will continue its slow growth while expanding its media presence over the next 10 years. The Electoral College has established support programs such as the Camp in Formation program, Mentor program, and Kaaba Colloquium which provide significant support to new body masters and new local bodies. I expect the Order to expand into new states and regions and to establish long-lasting local bodies in these areas. Thanks to the media attention that a few hard-working brothers and sisters have manifested, I expect that we will see more seekers at our doors. Letting people know what we have to offer and giving new local bodies as much support as possible is a foundation for continued growth and success. I have an internal locus of control. I take responsibility for my actions, and I feel that I can do almost anything when the proper focus and Will are brought to bear. This is in sharp contrast to the dominant Christian paradigm in which the seeker has an external locus of control and passively considers everything to be the will of God. I find Thelema to be immensely empowering because the pathway to the divine lies within myself. I take my life into my own hands and accept full responsibility for my decisions rather than seeking a divine “do over” through repentance. Everything about the Gnostic Mass speaks to me. I view the Gnostic Mass as I view a cherished lover. Celebration of the Mass is one of the central pillars of my spiritual praxis; even if it is just going through the Mass is a mentally constructed temple during my commute to work. I feel that the Gnostic Mass is easily one of the most beautiful and moving Western rituals ever constructed. As I previously indicated, I studied the Golden Dawn system somewhat before coming to Thelema. There are many similarities to Golden Dawn ritual in the Gnostic Mass. Thus, I felt right at home with the ritual the first time that I attended a celebration of the Mass. I had read the ritual and found it interesting, but actually attending a celebration of the Mass blew me away. I recall being entranced by the priest as he took the priestess by the hand and led her to the altar. I thought, “That is what I want to do in O.T.O.” I have now been an ordained priest for over ten years, and I continue to be deeply in love with the ritual. I continually discover new, amazing, and enlightening instruction within the ritual. For example, I had a delightful experience on one occasion as I was elevating the graal and host above my head. As the bell sounded, I looked at the graal and saw myself looking back into my own eyes with my arms elevated, wearing my vestments. I often feel that my ego consciousness dissolves when I celebrate Mass. However, in this moment, I came snapping back into my body to witness myself in a moment of sacerdotal rapture. It was a moment when time seemed to stand still. In the first century, Thelemites struggled to ensure that Crowley’s literary corpus would survive and to fully establish his magical Orders. Within the last couple of decades, we have seen more Thelemites writing and contributing original work to the Thelemic corpus. I expect that this will continue and the exploration of the ramifications of Thelema will deepen considerably. I expect O.T.O. to continue to grow and to continue in its work to manifest its vision of a Thelemic society. I expect that Thelema will continue to be a driving force in popular culture, and I sincerely hope that Thelema becomes more deeply rooted within academia. I would love to see O.T.O. establish permanent temples in major cities and begin to establish permanent Colleges of the Order (as written of in Liber 101) and Profess Houses. As Thelema moves further into the greater cultural consciousness, the challenge that I foresee will be to continue to maintain its vital spark without allowing it to be dulled by the lowest common denominator approach that seems to blunt all teachings as they are made “more palatable” to the common man. As Liber Librae indicates, “Worship and neglect not, the physical body which is thy temporary connection with the outer and material world. Therefore let thy mental Equilibrium be above disturbance by material events; strengthen and control the animal passions, discipline the emotions and the reason, nourish the Higher Aspirations.” Thelemites tend to be a cerebral lot. It is vitally important to integrate a body-based discipline to your daily practice. The Cartesian split is false; the mental faculty declines when the body declines. Therefore, be sure to keep yourselves in good physical shape. Neglect not your vehicle in Malkuth! Additionally, do not neglect your psychological equilibrium. It is often much more pleasant to keep your eyes set on the highest of aspirations while neglecting your more base and often unpleasant psychological processes. Israel Regardie strongly suggested that magicians seek therapy. This helps practitioners to avoid spiritual bypassing. Integrate the shadow and the light. Seek harmony and balance. Practice moderation in everything… especially moderation!